A contemplation of the fabled city which for the Western mind is as much a myth as a physical reality. 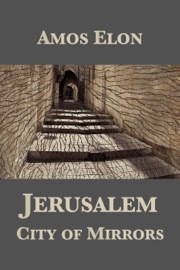 Amos Elon’s elegant, dazzling biography of Jerusalem gives a profound insight into the kaleidoscopic culture of this magical city. Battle-scarred from four thousand years of violent conflict, the holy city is a sacred symbol of Judaism, Islam and Christianity, and its religious wars of today reflect those of the past — Arab versus Jew, orthodox versus secular, continuity versus change.